Fairmont President’s Club has their winter 2013 promotion up that is for double airline miles and discounts for stays until April 30, 2014. There is a long list of property specific blackout dates. You get 15% to 20% off (additional 5% off for President’s Club members) or 3rd or 4th night free depending of the hotel/resort. You can access this offer on Fairmont’s website here. 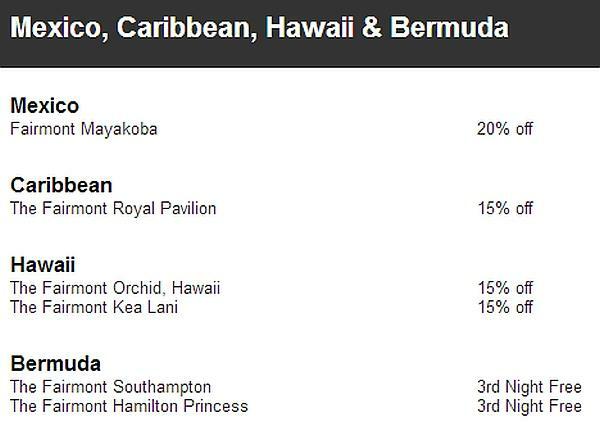 This rate maybe worth checking, but these Fairmont promotions tend not to be very exciting. Book now for stays until April 30, 2014. 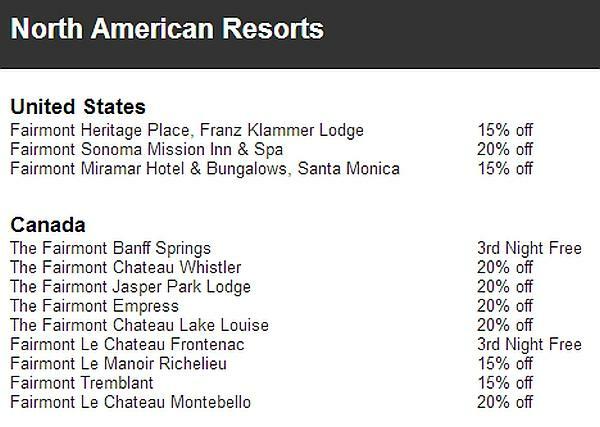 Offer is subject to availability at time of reservation at participating Fairmont Hotels & Resorts locations worldwide. Offer varies by property and includes one of the following: up to 20% off the room rate at the time of reservation OR a complimentary consecutive night stay at a single property based on a minimum night stay. Advanced reservation is required and a non-refundable deposit will be taken at time of reservation. Members booking the Fairmont President’s Club exclusive offer may be required to present identification at check-in to receive an additional 5% off. Earn double reward miles with the American Airlines AAdvantage program, Aeroplan, Asia Miles, Japan Airlines, JetPrivilege, PhoenixMiles, MileagePlus and Miles&More. Mileage program membership number must be provided to the hotel, and can be added to the guest’s Fairmont President’s Club profile. This offer is subject to change without notice and cannot be combined with any other offer. Blackout dates apply and vary by property. For complete offer details by property please visit fairmont.com/winter. Previous articleAlitalia On Verge Of Bankruptcy AGAIN?